PDF Fillable Form 12.903(a) Answer, Waiver, and Request for Copy of Final Judgment of Dissolution of Marriage. 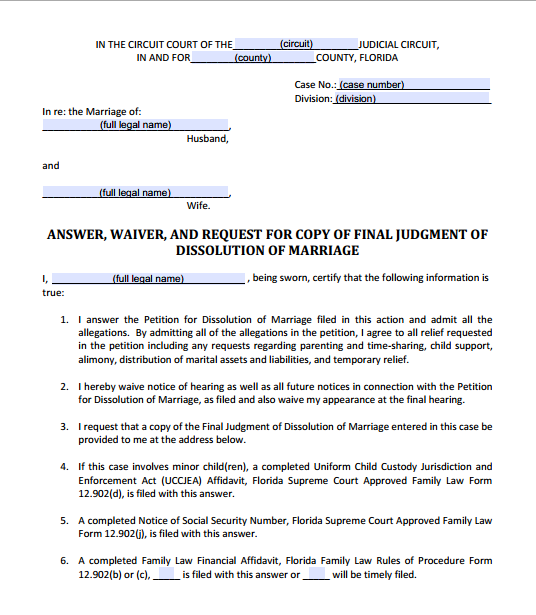 This form should be used when you have been served with a petition for dissolution of marriage and you do not wish to contest it or appear at a hearing. If you file this form, you are admitting all of the allegations in the petition, saying that you do not need to be notified of or appear at the final hearing, and that you would like a copy of the final judgment mailed to you.